The WG has also adopted the United Nations Convention on the Rights of the Child (UNCRC, 1989) as the basis of all its work. 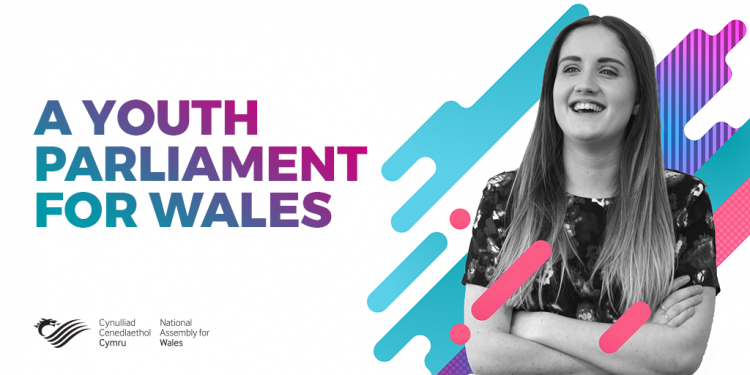 This has implications for pupil participation and it is a statutory requirement for all schools in Wales to have a school council. 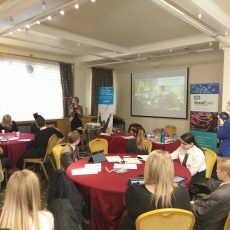 However, participation is much wider than the School Council and many schools want to go beyond this and fully integrate pupil voice into the school community. 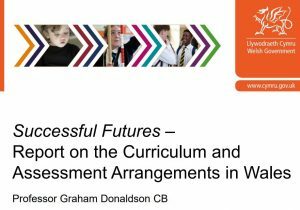 The Donaldson Review of education in Wales identified a key purpose of the new curriculum is to produce “ethically informed citizens… ready to be citizens of Wales and the world” (Donaldson, 2015: 33). 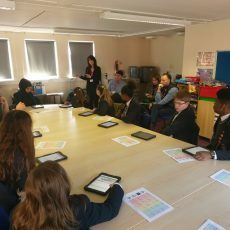 Donaldson calls on schools to build young people’s digital skills and help young people become “ethical, informed citizens” who can “engage with contemporary issues”, “understand and exercise their human and democratic responsibilities and rights”, “respect the rights of others” and “show their commitment to the sustainability of the planet”. The WG policy on ESDGC (Education for Sustainable Development and Global Citizenship) can support teachers and schools in developing ethical citizens. 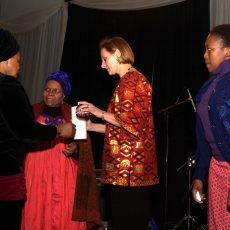 “citizenship requires the kind of understanding of democracy and human rights, interdependence and social justice that should inform personal views and sense of commitment… Active citizenship requires the confidence and resilience that underpin the ability to exert influence and participate in vigorous debate”. Central to achieving these goals of citizenship is the requirement to become competent digital citizens. However, recent research identifies that there is a significant mismatch between the digital skills acquired during education years and those that are needed for use in later life. 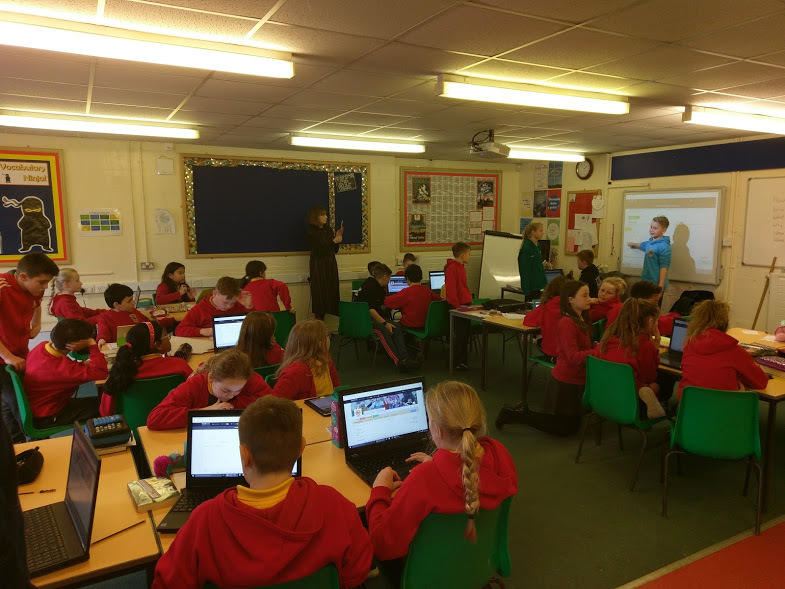 Schools in Wales are required to find ways of promoting citizenship that is participatory and can promote democracy. 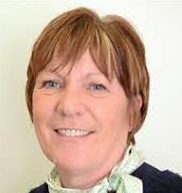 Recently Sue Lyle at Dialogue Exchange has been working with Peter Anderson at VocalEyes to help schools turn the rhetoric into action. 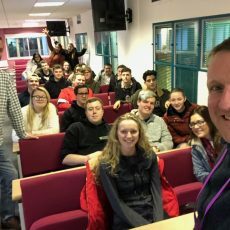 Working with schools in Swansea, Cardiff, Pembrokeshire and Carmarthenshire we have embarked on the journey towards participatory democracy in schools that will fulfil the vision of Donaldson by helping students gain digital literacy and prepare them to take part in the upcoming Youth Parliament. 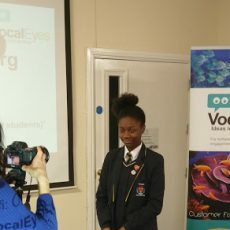 VocalEyes is a digital participatory democracy platform that has can bring together digital competence, pupil voice, citizenship and ESDGC across the primary and secondary school. 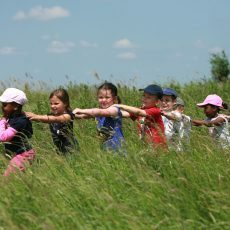 It supports the UNCRC participation rights for children including the right to a voice, the right to be listened to, to exercise agency and negotiate meanings with others. 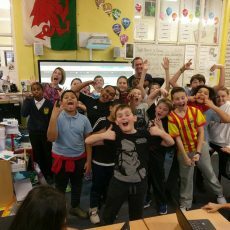 Results from pilot schools has led to the Local Authority in Cardiff to integrate VocalEyes into all 128 of its schools. 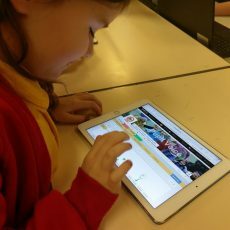 They believe that this online platform can help children and young people of Cardiff can gain much of the knowledge, skills and attitudes they need to become confident, creative and critical users of technologies and systems in our digital world. 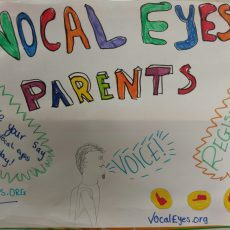 VocalEyes seeks to create and facilitate a participatory digital community in the school to ensure every child and young person (CYP) feels their voice is heard and acted upon. 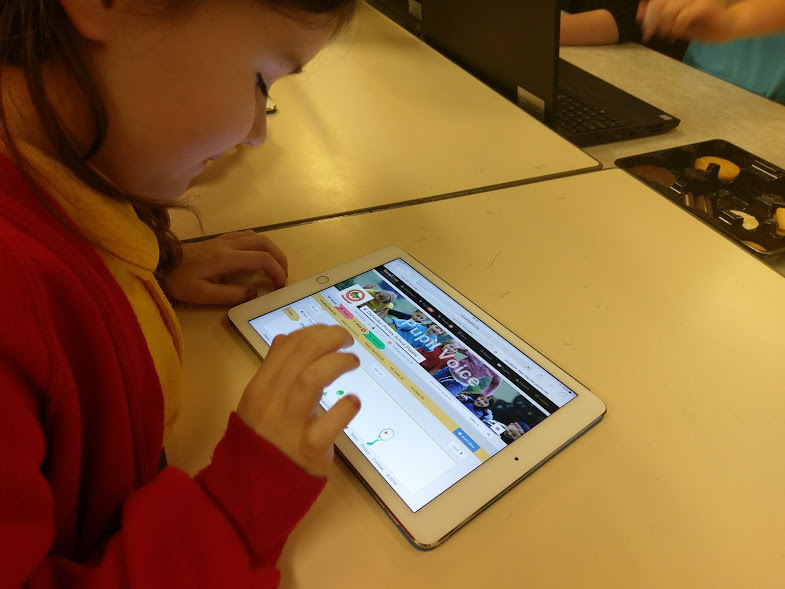 It creates the structures and opportunities for young people to learn and demonstrate their digital skills, but far more than this, the platform sees students as active partners in the process of learning and school decision-making and is designed to support CYP to influence their own education and what happens within and beyond the school. 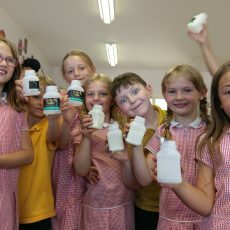 The schools involved in the pilots have shown us that students have important ideas about how the school can be improved. 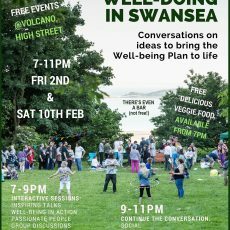 When they know that their ideas are welcome and will be taken seriously they feel valued and gain agency in the school. 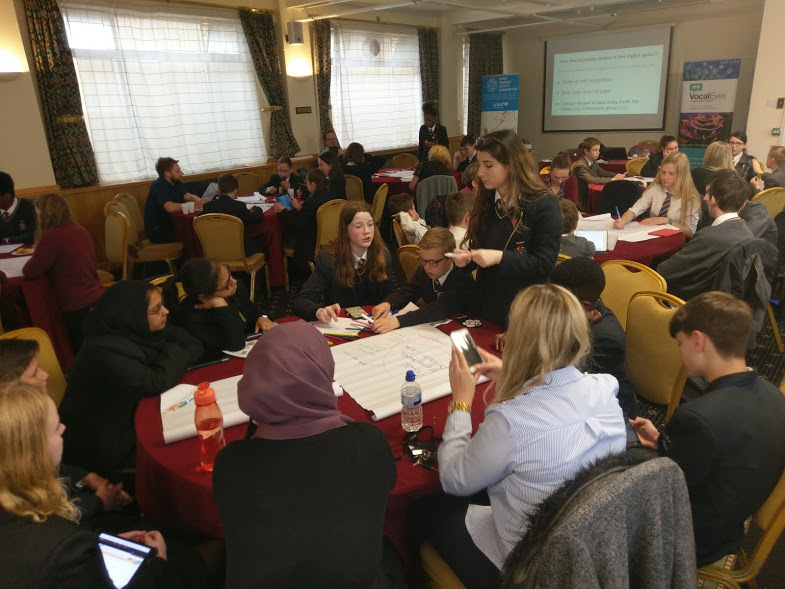 CYP know first hand what works for them, but a significant problem is how to listen to the voice of all students, not just those who have been elected to the School Council. To embed participatory democracy in a school culture takes time and includes the following stages. Each stage covers many of the learning outcomes identified in the Digital Framework for Wales. 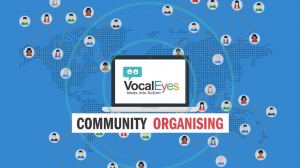 A VocalEyes platform is set up for each school and a Participatory Democracy Group of children and young people from across the school is established to lead the initiative with pupils supported by a teacher who takes on the role of VocalEyes Coordinator. This is really important. All comments entered on the platform are marked ‘pending’ before they go live. The PDG group takes on the job of examining the comments before they go live. 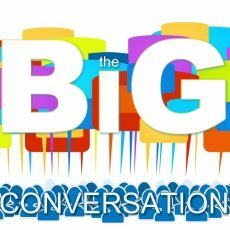 This is an important stage in digital etiquette as the young people look at the comments and decide if any can go live and what to do if any are deemed inappropriate. 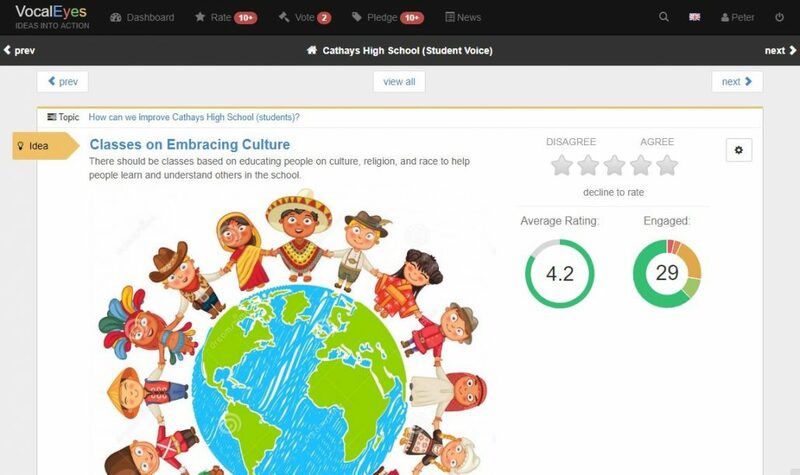 Unlike social media sites that often attract negative or personal comments that can lead to cyber bullying, VocalEyes is anonymous so only the editor (the VocalEyes Coordinator) can see who has made the comments. 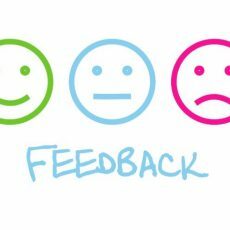 If the PDG are unhappy with a comment they explain why to the VC and if it is decided that the comment can’t go live the teacher can see who made it and take appropriate steps to explain why it wasn’t approved for the site. 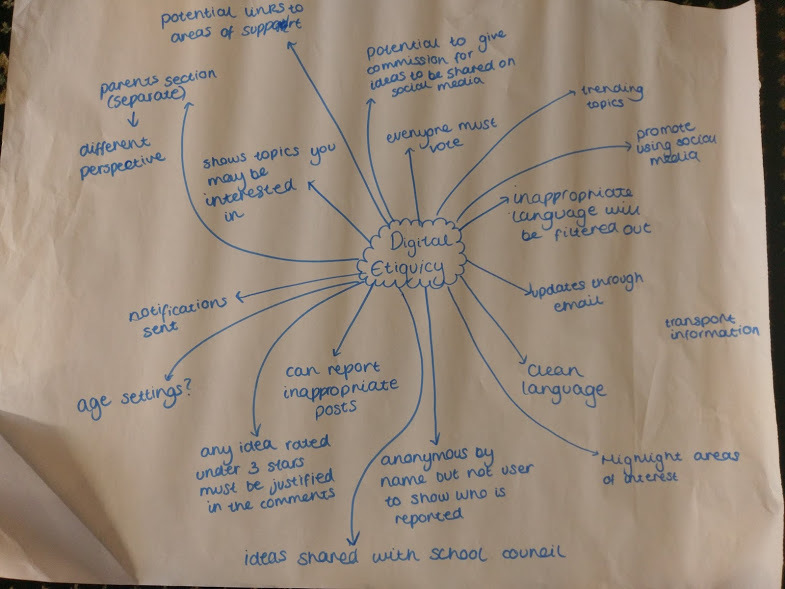 Students have welcomed this aspect of the platform as many of them have been victims of cyber bullying and can see how this approach is preventative. The PDG group start the process of analysing the results as the whole school is involved. At the press of a button they can see what rating each idea has had and how many people have rated it. They can see the ranking of each idea so the ones that have attracted the most stars and engaged the most students rises to the top of the list. The next job of the PDG is to examine the highly rated ideas and decide whether or not they are worded in a way that indicates clear action priorities. 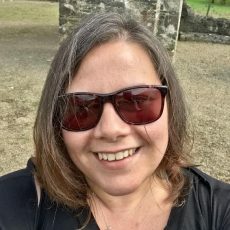 This is important if they are going to have clear ideas for action to present to senior management (we discuss this process in our next blog: a case study of VocalEyes in action). 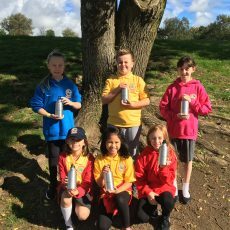 Once clear ideas for action have been identified the PDG create a report to present to the School Council who in consultation with senior management decide how to proceed with action. All stages of the procedure can be logged onto the VocalEyes platform to keep a permanent record of meeting minutes of all discussions that maps the progress of ideas from initiation to action. Once action has been taken, or it has been decided that action can’t be taken at this time, the ideas can be archived with clear reasons logged for the decision. This provides an open and transparent record of everything that has taken place making it very easy when students leave the group and new students replace them. Once an idea has been approved for action it is possible to make use of the participatory budgeting tool in the platform which clearly shows how much money is needed to take an idea to action and to understand how money is allocated or raised and spent. This has the potential to develop financial understanding and sound budgeting skills. Participatory budgeting allows children to see how the budgets work and helps them to gain a sound understanding of the principles of budgeting. 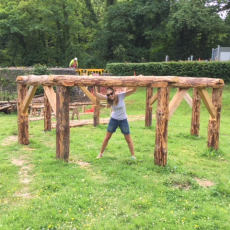 This can lead to fund-raising or crowdsourcing to raise the money to finance their ideas – more on how one school does this in a future blog. 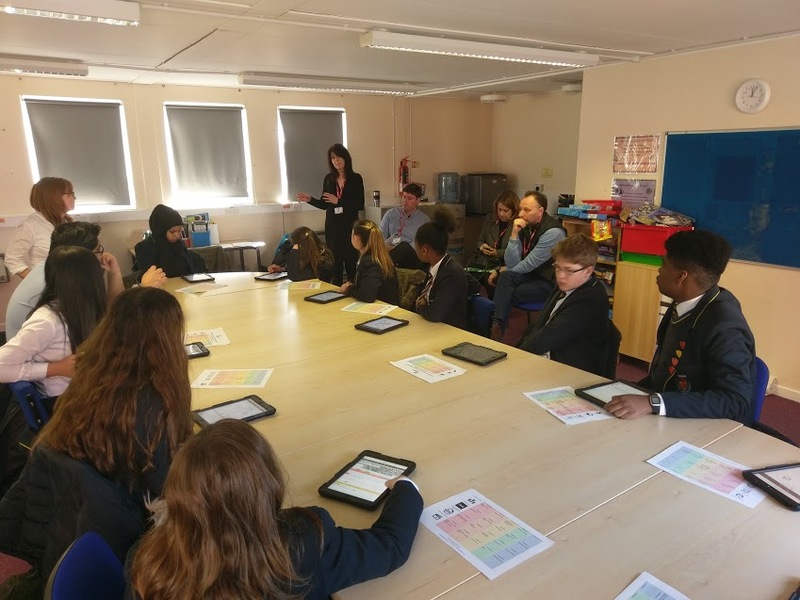 Once the platform is being used regularly by having VocalEyes time built into the timetable the school will be well on its way to becoming a model of participatory democracy in action as it listens to pupil voice by teaching the skills necessary for digital competence and democracy. What a great preparation for the upcoming Youth Parliament!